Continuing the legacy of benevolence that began ten years ago when the late music industry legend Henry Stone discovered blind saxophonist Jeff Zavac and featured him on “Instrumental Magic,” generating over one million dollars in contributions to the Miami Lighthouse for the Blind - the organization that came to the aid of the renowned record pioneer when he lost his vision in his later years - Henry Stone Music released the second collection on Friday. 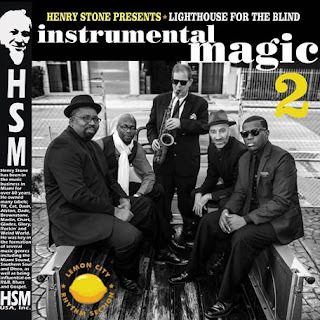 “Instrumental Magic 2,” showcasing Zavac with the Lemon City Rhythm Section and produced by Stone’s son, Joe Stone, and guitarist Aaron Fishbein, spotlights the saxman rendering soul-jazz interpretations of ten hits written or made classic by sightless artists including Stevie Wonder, Ronnie Milsap, Jose Feliciano and Ray Charles, the last of whom was first recorded by Henry Stone in the 1950s. The five-piece Lemon City Rhythm Section – Zavac (sax, flute, woodwinds), Fishbein (guitar), Jerald Dorsett (keyboards), Shaka Pace (bass) and King David Hill (drums) – will perform music from “Instrumental Magic 2” at jazz hotspot Ball & Chain in the Little Havana section of Miami on Monday, June 27 at 6:30pm. Tickets are free while donations to the Miami Lighthouse for the Blind will be accepted at the venue and online at https://secure.miamilighthouse.org/Donations.asp. Henry Stone, who forged an enduring legacy in R&B, dance and rap music prior to his 2014 passing at the age of 93, launched the “Instrumental Magic” series with the goal of creating modern American music with a classic American feel. Joe Stone was inspired to continue his father’s mission of positivity by promoting music recorded by live players while raising awareness and funds for the association that taught his father how to live without sight. “Henry lost his sight in the last decade of his journey here on earth and Miami Lighthouse was a huge part of his ability to move forward,” said Stone, general manager of Henry Stone Music. “It is an honor and a joy to work with this group of very talented musicians on an important production that carries on the Henry Stone legacy. Musically, ‘Instrumental Magic 2’ creates a sonic palette filled with funk, soul, salsa, rock, R&B and jazz covering American standards loved the world over." The first “Instrumental Magic” disc, one of the last albums produced by Henry Stone, paired Zavac with 1970s soul queen Gwen McCrae. The record remains one of the Henry Stone Music label’s most popular releases having received millions of plays on Spotify alone. After losing his eyesight during cataract surgery while in his 80s, Stone turned to Miami Lighthouse for the Blind where he learned to adapt. In an effort to “repay” the organization that helped him, Stone facilitated a million dollar donation that funded the creation of a recording studio for the blind now named in his honor. His act of leadership and philanthropy garnered the inaugural Man of Vision Award in 2008 from Miami Lighthouse for the Blind, which provides vision rehabilitation and eye health services that promote independence, educates professionals and conducts research in related fields. For additional information, please visit www.MiamiLighthouse.org.